The fierce Category 4 storm was briefly upgraded to a Category 5. Images of Hurricane Lane from space as it approaches Hawaii are truly a sight to behold. Recent satellite images captured by both NASA and the National Oceanic and Atmospheric Administration (NOAA) show the massive Category 4 storm that is likely to be very dangerous for anything and anyone in its path. The hurricane, which is forecasted to begin hitting the Hawaiian islands later on Wednesday, has already led the governor of Hawaii, David Ige, to declare a state of emergency. This comes after more than 600 homes were swallowed by lava from the Kilauea volcano, which erupted May 3 and continued to flow through June. After winds clocked in at 160 mph on Tuesday night, NOAA upgraded Hurricane Lane to a Category 5 storm through Wednesday morning, when it was eventually downgraded to a still-powerful Category 4 storm. 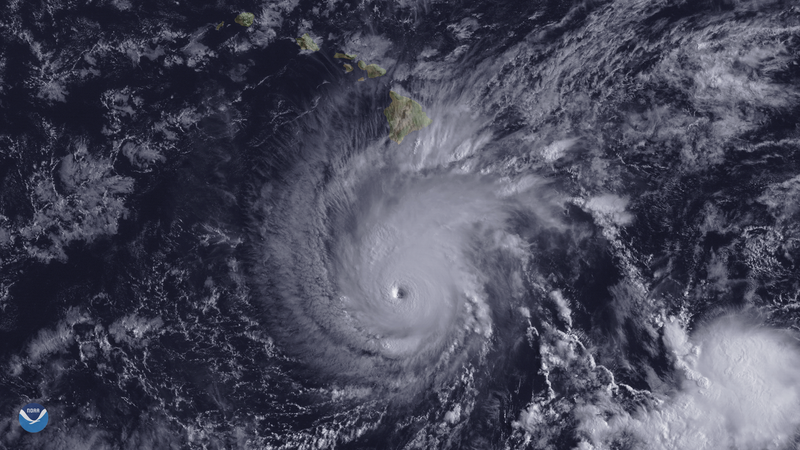 To get a better understanding of the magnitude of this storm, look no further than satellite images and videos of Hurricane Lane from space. The NASA SPoRT Twitter account even called the eye of Hurricane Lane “impressive” based on a low-resolution shot. Meteorologists believe the storm’s center will pass close to Hawaii between Wednesday and Saturday, and an estimated 1.43 million people who live in Hawaii will likely have to buckle down for those days. If these images from space are any indication, Hurricane Lane is taking up a lot of room in our atmosphere as it carves a path of possible destruction.